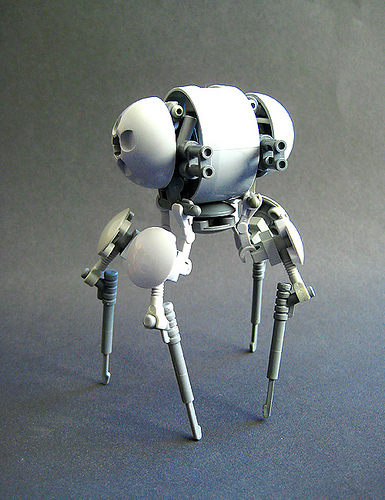 I’m with Kevoh on this robot from Tim “Spook” Zarki — I imagine this thing a thousand feet tall, delicately stepping over the skyscrapers of a future metropolis. It has almost an “Aperture Science” look to it: crisp and white-colored. I say it looks about man-sized. Looks like it wants to stalk you and shoot you when it finds you. Great use of the orb pieces.